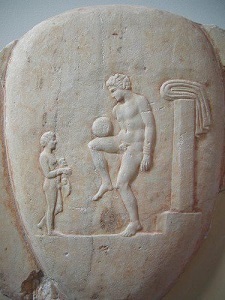 China, Greece, Rome, and Central American countries all claim they started the beloved sport of soccer nearly 2,000 years ago. It might surprise you to learn, however, that soccer actually became the sport we know today in England. The English were the first to make the modern rules for soccer. The very first rules included not being able to trip opponents or touch the ball with your hands. Later rules included the penalty kick, which was created in 1891 and red and yellow penalty cards, which were introduced in 1970 during the World Cup finals. Goalkeepers were prohibited from handling deliberate back passes in 1992, and tackles from behind became red card penalties in 1998. Over the years, a few soccer players have stood out for their achievements. One of the top players in soccer history is Pele, who scored six goals in the 1958 World Cup. Lev Yashin from Russia allegedly prevented more than 150 penalty shots during his outstanding goal-tending career. And Marco Van Basten from Holland won several soccer awards in a single year. Currently, the best soccer player—according to many—is Lionel Messi, who plays for Barcelona, a team for which he has scored hundreds of goals. Although soccer as we know it today started in England, the sport has since become an international sensation. There are 3.5 billion fans around the world. And according to a recent survey by the Fédération Internationale de Football Association (FIFA) there are over 265 million people involved in soccer around the world. This is roughly four percent of the world’s population. Despite the debate over soccer's origin, one fact is clear: people all over the world play and love soccer.